The state-run Petra news agency said, on Tuesday 03/01/2016, three members of the security forces had been injured. It also said some fighters had been killed and injured in Irbid’s Palestinian refugees camp Early reports say the fighters in Irbid, which is near the Syrian border, may be Islamist militants. 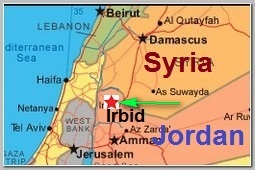 Irbid is located less than 20 k”m from the Southern Syrian border where Syrian regime forces are fighting Islamic militants ans Russian air force is conducted daily heavy bombardments and it is most likely that some of the Militants fighting in Syria are looking for shelters and refuge in Northern Jordan. Heavy gunfire could be heard in videos purportedly from the scene published by local media. Some officials and local media described the gunmen as “extremists” but it is not clear whether any organised group is behind the incident. In last January 2016, the chief of Israel’s armed forces warned Jordan could become a target of I.S.I.S attacks. According to Israeli intelligence sources the Jordanian security forces nabbed dozens of Islamic State supporters and fighters in the Irbid operation . The more the military pressure on Islamic militants in Syria is growing the more they divert their attention to neighbor Arab countries like Iraq and Jordan . Jordan said, on Wednesday 03/02/2016, the raid in the city of Irbid left 7 suspected jihadist militants dead and foiled attacks being plotted by so-called Islamic State. Those killed were planning to blow up civilian and military targets in the country, according to the General Intelligence Directorate (GID).